A policeman has apologised after tweeting a picture of officers horsing around in a children's playground. 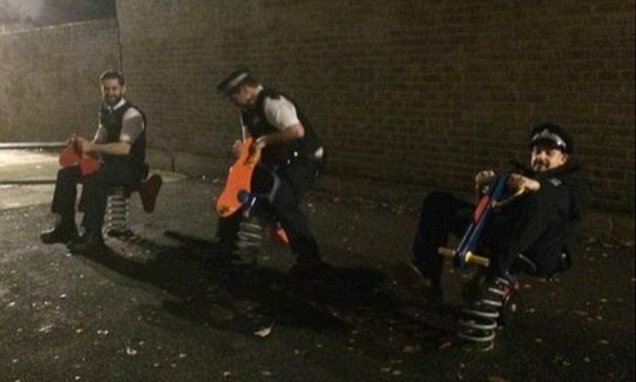 Sergeant Pete Shaw came under fire after posting the image of himself and uniformed colleagues riding the play equipment while out on patrol in Tottenham, North London. It has since been removed and replaced with an apology from Sgt Shaw from the Seven Sisters neighbourhood team. 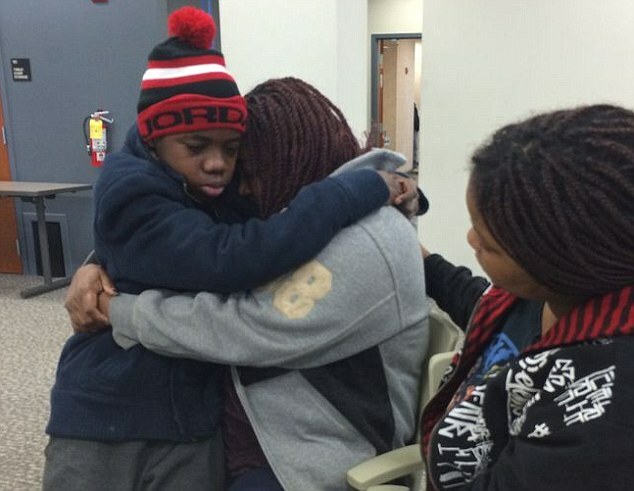 This is the emotional moment a 13-year-old boy who was missing for four years was reunited with his mother after being found imprisoned behind a false wall in the linen closet of his father's home. The unnamed teenager reportedly downloaded a cellphone app to text his Florida-based mother to tell her he was being held captive and beaten at the house in Clayton County, Georgia. Police arrived at the scene and found the boy hidden behind a false panel in a linen closet in the property's garage. He repeatedly thanked officers for rescuing him, according to reports. TEN days ago, precisely November 17, sudden death took away 30-year-old Emokiniovo Anthony Ogbodo, first son of the editor of The Guardian on Sunday, Abraham Ogbodo. It has been 10 days of anguish and numbness for the Ogbodo clan and it would take a couple of days, weeks, or maybe months more before life is restarted from where it was paused two Mondays ago. I started acting when I was in primary school and I began with Baba Oyin Adejobi. Back when I was in Ansarudeen School, I was part of the pupils sent to the residence of Baba Oyin Adejobi to learn how to act. Then people would gather to watch us perform after the training and whatever money we made was used to pay our Malim (Arabic teacher). We acted plays like Adam and Eve, Joseph and his Brethren,among others. That was where I developed interest in drama. My family trade is tailoring and I was also involved in it but after leaving the modern school, I joined Oyin Adejobi. After my primary school, I travelled to the East to continue my education because that was where my mother was at the time. Due to the nature of our family business, it allowed for extensive travelling. After I was done with the modern school, I came back to Osogbo where I fully joined Oyin Adejobi. Then, my father had died. THE theatre of political absurdity which Ekiti State is fast turning to is highly despicable and should be condemned by every peace-loving Nigerian. Suddenly, democracy in the state has assumed a dangerous object of derision by stakeholders, no thanks to those politicians who decided to pervert legality and constitutionality in the quest for power. Having been directly accused of masterminding the crisis – and unless he can show otherwise through concrete means – it will be difficult for Governor Ayo Fayose to stand blameless in the ensuing breach of constitutional order. President Goodluck Jonathan on Friday publicly lamented that he was unable to make a Yoruba politician the Speaker of the House of Representatives after 2011 general elections because of the selfish agenda of some Yoruba leaders. He spoke at the Yoruba Unity Summit with the theme: “National Development: Wither the Yoruba,” which held at the Oduduwa Hall of the Obafemi Awolowo University, Ile-Ife. Jonathan who was the special guest of honour at the event organised by the Yoruba Unity Forum, said he recognised the Southwest as a key player in the country and was still haunted by that unfortunate incident in 2011 when his desire to repay the Yoruba for their support for him was lost. Mulikat Akande had then vied to be Speaker of the House of Representatives but lost to Aminu Tambuwal of the Northwest because of inadequate support from her Southwestern colleagues. A Ghanaian woman has been arrested by security operatives at the Heathrow Airport in London, carrying what is believed to be one of the largest consignments of cocaine ever impounded at Heathrow. She was alleged to be carrying a Ghanaian diplomatic passport at the time of her arrest. 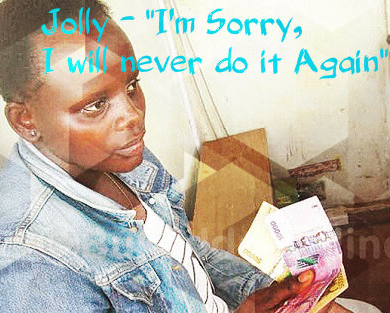 Officials have given her name as Ruby Adu Gyamfi, who was reportedly carrying cocaine weighing 12.5kg, estimated at about 3.5 million pounds or $5 million. Madam Ruby Adu Gyamfi, who is said to be very popular among Ghana’s current political establishment, is popularly known as ‘Angel’. Sources say some officials believed to be staff of the Ghana High Commission were at the airport to welcome her but could not reach her as she was intercepted before the final immigration point. ‘Angel’ went through screening procedures at the Kotoka International Airport without any problems but was busted in London, after airport security officials ignored the usual courtesies accorded holders of diplomatic passports, isolated her and conducted a thorough search which revealed the white substance in her hand luggage. 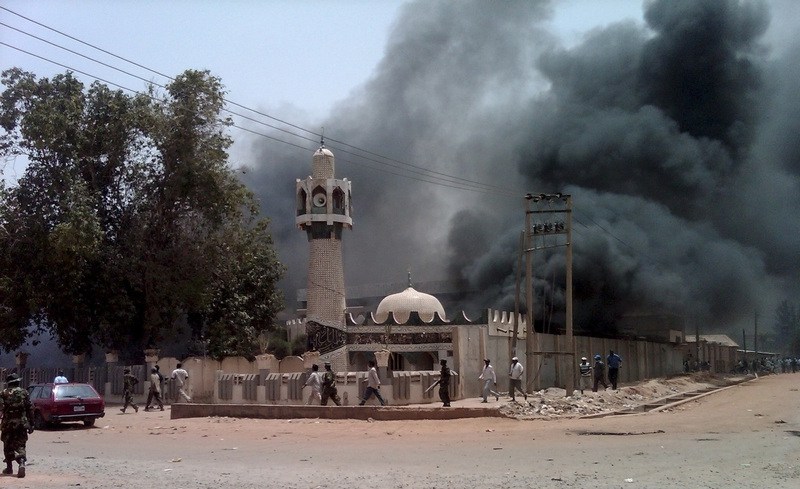 A bomb blast has occurred outside the central mosque of Kano, as people were packing into the area for Friday Prayers. Scores of people are feared dead in a bomb blast at Kano Central Mosque, near the Emir’s palace and though details of the bomb blast are still sketchy, an eye witness told Reuters that a lot of people are currently down injured and screaming. "These people have bombed the mosque. I am face to face with people screaming," said Chijjani Usman, a local reporter who resides in Kano told Reuters. The bomb reportedly went off as Muslim faithfuls prepared for their Friday jumaat prayers, triggering serious uproar as people ran helter-skelter for their lives. Multiple explosions tore through the central mosque in Nigeria's second-largest city on Friday, killing over 100 people, police said. One hundred and fifty others sustained various degrees of injury in the blasts in the city of Kano, State Deputy Police Commissioner Sanusi Lemu said. Hundreds had gathered to listen to a sermon in a region terrorized by attacks from the militant group Boko Haram. 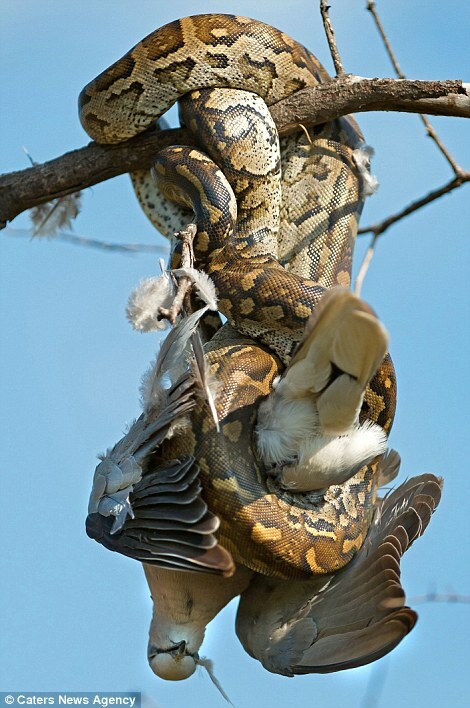 If this majestic dove thought it was safe from predators perching on the branch of a tree, it was clearly wrong - as it ended up becoming dinner for a baby python. Ranger Marc Lindsay Rea came across the incredible sight as he drove through the Madikwe Game Reserve, in South Africa. The unfortunate dove had taken refuge on the branch of a buffalo thorn tree - presumably thinking it was a perfect lookout point to spot predators. 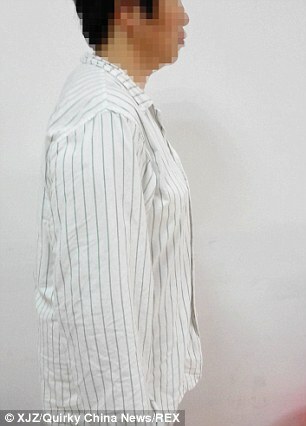 A Chinese woman has undergone drastic surgery to remove just under one stone of tissue from her breasts. 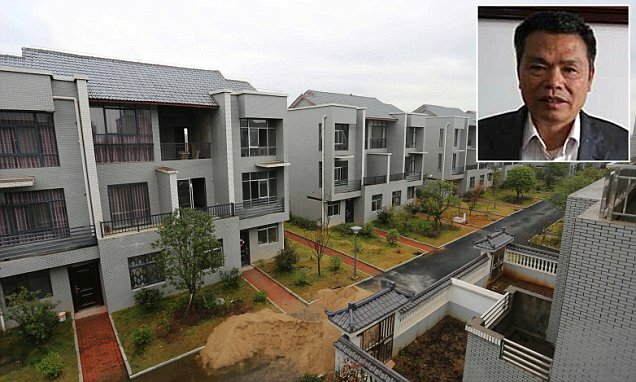 The woman, known only as Mrs Lin, from Xiamen in China's Fujian Province, noticed her chest began to grow rapidly in her 30s. The now 50-year-old finally visited doctors when the size became unbearable. A local butcher and the wife he is thought to have murdered before plunging to his death from a multi-storey car park. Oliver Ruse, 37, was found dead at the foot of a six-storey car park in Bury St Edmunds at 12.10pm yesterday. After finding the body, police went to a cottage the man's wife is thought to have been renting in nearby Long Melford, where they discovered her body inside at 2.40pm. The deaths leave the couple’s four daughters - all believed to be aged between 11 and six - without parents. They are now being looked after by family members. The death toll from bombing of the Kano Central Mosque have reached at least 100, according to the National Emergency Management Agency (NEMA). Officials of the agency also stated that they expected the death toll to rise as more than 150 people were critically injured in the attack. Several people were killed in a gun and bomb attack during prayers at one of the biggest mosques in the northern Nigerian city of Kano, officials say. Early Tuesday morning, Dornella Conner was “riding around, respecting Mike Brown” with her boyfriend De’Angelas Lee when she was injured with flying shards of glass after police officers fired into her car with specialized “bean bag” bullets, designed to help control rioters and unruly protesters. The beautiful mum of two says the boutique will have an accessories, hair and cosmetics shop. The video features features Mr Nigeria and MTV Shuga star Emmanuel Ikubese as Tiwa’s husband. It also features designer Kunbi Oyelese of April by Kunbi who made a lot of the outfits in the video and Tiwa’s glam squad including MUA Dave Sucre and Ola. more reason I referred the anger to the baby but I’m sorry. A double bombing during Friday prayers at one of Nigeria‘s most prominent mosques killed at least 64 people and injured another 126, a rescue official said. The official, who requested anonymity as he was not authorised to speak to media, said 64 bodies had been brought to just one Kano area hospital after the attack at the city’s central mosque, and the wounded figure reflected statistics from three hospitals. Two bombs exploded at the mosque of one of Nigeria‘s top Islamic leaders Friday, a week after he issued a call to arms to fight Boko Haram. The blasts happened at the Grand Mosque in Kano, the biggest city in the Muslim north of the country, just as Friday prayers had got under way at about 2:00 pm (1300 GMT). The mosque is attached to the palace of the Emir of Kano, Nigeria‘s second most senior Muslim cleric. The explosions came after civilian vigilantes in the northeastern city of Maiduguri said they foiled a bomb attack against a mosque, five days after two female suicide bombers killed over 45 people in the city. Dr. Goodluck Jonathan as a Fashionable Young Man in the 70s. An improvised explosive device (IED) has exploded at the Kano Central Mosque in the ancient city. This happened during Friday prayers at the mosque. The Emir of Kano, Mohammed Sanusi II, who usually prays at the mosque was absent from the mosque during the explosion. Details of casualties are still sketchy but many are feared dead. The level of impunity in the land under Goodluck Jonathan has reached an all time high and the heads of the security agencies are trampling on the laws, disrespecting lawmakers. A source in Abuja told us that the illegalities wont be allowed to continue, there will be some serious consequences and it has started. 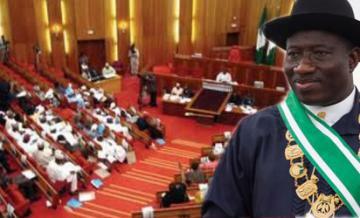 Already 63 senators have now signed up to the plan to impeach President Jonathan in the upper legislative chamber as of Thursday. One of the arrowheads of the move to remove Jonathan in the Senate showed a Punch correspondent the list containing the signatures of the 63 senators who have signed the impeachment notice. I was getting a manicure the first time I learned that not all wives want to, ahem, go for a roll in the hay with their husbands. I was 16 and had picked out orange nail polish(oh, sixteen). I had a book with me but it wasn't long before I found another source of entertainment. In-between buffings and polishings, the two women next to me talked about how much their husbands wanted IT and how little they wanted to give IT. For a girl that had not even been asked out on a date this was a whole new world. I had a suspicion that their experience was more realistic than the articles I sneaky read inCosmo while getting my hair done at the salon. (I am supposed to put my hand WHERE? while simultaneously doing WHAT?) So I kept my eyes on my book, let the words blur into lines and listened closely. "Doesn't he know how tired I am by the end of the day? As if after the kids are finally asleep I have the energy to do anything but sit down and watch some TV." Jenna and Jillian Thistlebate marked their arrival to the world in a very special way. The twin girls garnered plenty of attention after they were spotted holding hands immediately after birth. "It was remarkable," their mother Sarah explained, "I think half of the OR was crying." 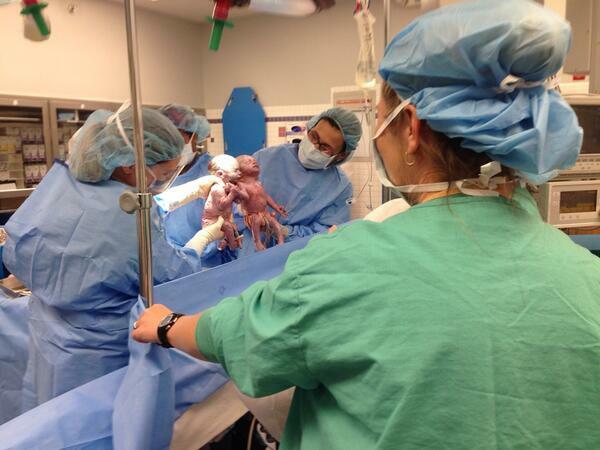 Jenna and Jillian are monoamniotic twins, meaning they share the same placenta and amniotic sac. 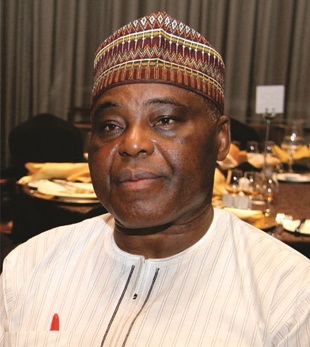 After 20 years in the saddle, Founder of DAAR Communications PLC, High Chief Raymond Aleogho Dokpesi, steps down as Chairman of the Group today, November 28, 2014. News Express learnt that he will be handing over to his son, Raymond Dokpesi Jr., until now Executive Director in charge of Special Projects at DAAR. A marine engineer and politician, Dokpesi forayed into media entrepreneurship in 1994 with Nigeria’s first private independent radio station, Raypower 100.5FM, which pioneered 24-hour broadcasting in Africa’s largest economy. She is currently one of the hottest women in the whole of West Africa and after viewing these photos, you'd know exactly why. The VERY VERY VERY voluptuous Ghanaian actress, Peace Hyde, has been forced to speak up, refuting claims that her br**sts and buttock are so big because she has had implants fixed on her body. Take a drive though any city or large town in Nigeria and the chances are you will come across numerousprivately owned health clinics, doctor's surgeries and hospitals. They are so widespread because Nigeria's state-run health system – ranked at 197th out of 200 by the World Health Organisation – is chronically underfunded and so overstretched that it simply cannot meet all the demands made on it. Private medicine fills the gap and in the best cases, at least for those who can afford it, it can provide a valuable alternative service. 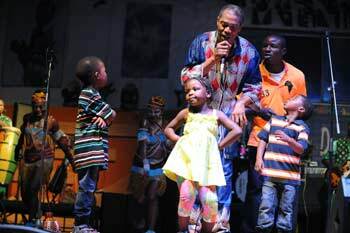 AFROBEAT king, Femi Kuti who clocked 46 two weeks back has revealed in a recent interview with Encomium that he still regrets that he is not the father of two of his five children. Out of his alleged five children: Made, Afolabi, Dupe, Tosin and Ayomide, two of them, Dupe and Tosin (a boy and a girl) have been discovered not to be his biological children, according to a recent DNA test. Brazil great Pele, 74, has been taken into a special care unit in a Sao Paulo hospital after his health worsened, three days after being admitted with a urinary infection, the hospital confirmed. 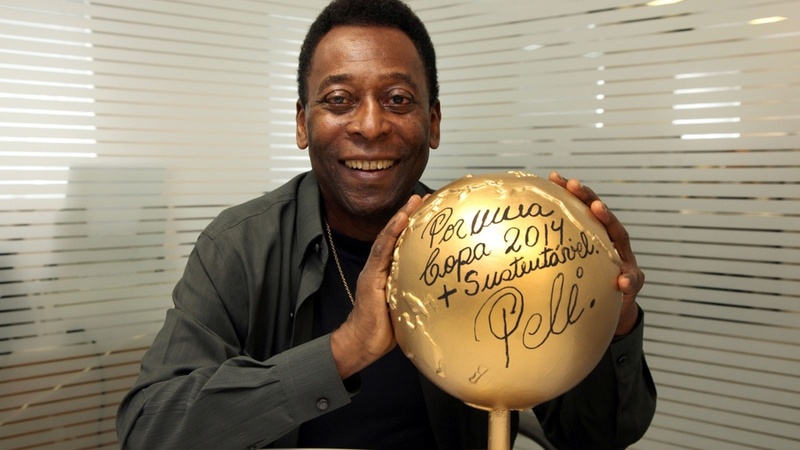 "Edson Arantes do Nascimento (Pele) remains in hospital. To receive the best care he was transferred in order to be monitored in a special care unit," read a statement released by the Albert Einstein hospital in Sao Paulo. Pele underwent surgery for kidney stones on November 13 before being released two days later. Nollywood filmmaker and self-proclaimed culture critic Charles Novia says there should be no fuss about international stars who have big butts, because African women are naturally endowed will theirs are usually artificial. He explains that Nicki Minaj, Kim Kardashian and Jennifer Lopez should be jealous of Mercy Johnson, Yvonne Okoro and a lot of African women – especially Yoruba women. I know the hidden agenda of Kim Kardashian, Nikki Minaj and Jennifer Lopez. Yes, I know. These ladies are jealous of Mercy Johnson, Yvonne Okoro and one of my female relatives in the village. Hidden cameras have caught dozens of men AND women gawping at three young womens' backsides as they walked through a city centre. This video shows the footage from one of those cameras. From an elderly lady, to two orthodox Jewish men - the video showed a true cross section of society catching a sneaky peak the three women's bottoms. The Inspector general of police, Sulaiman Abba, appeared before the House of Representatives Police Committee today after several days of ignoring their invitation. The meeting chaired by Usman Bello Kumo quickly denigrated into bad blood between committee members and the IGP. The IG had opened his statement explaining why the police incaded the house last week by rehashing the initial police statement that they had credible intelligence that some thugs had planned on causing mayhem at the resumed sitting of the house. Former model Irene Major is the wife of Canadian oil tycoon Sam Mail. 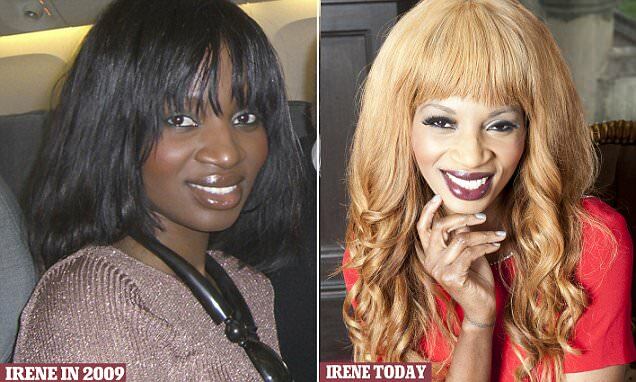 She has used skin lightening creams to drastically change her appearance and says she feels much prettier. Last month, High Street health store Holland & Barrett came under fire for selling a legal skin-whitening product called Dr Organic Royal Jelly Skin Body Whitening Cream, which retails for £9.99. The Oba of Lagos, Rilwan Akiolu, has said the Peoples Democratic Party (PDP) will never produce a governor in Lagos, Nigeria’s commercial capital. The PDP has however intensified its plan to win over the state from the the All Progressives Congress in the forthcoming elections. The police in Lagos are battling to unravel the killers of a former director of the Lagos State Government, Mrs. Oluremi Jaiyesimi. The 63-year-old was found dead in her house in the Abraham Adesanya Estate, Ajah area of the state. PUNCH Metro exclusively gathered from sources that the corpse of the former Director of Social Welfare in the Ministry of Youths and Social Development was not discovered until a week after she died. 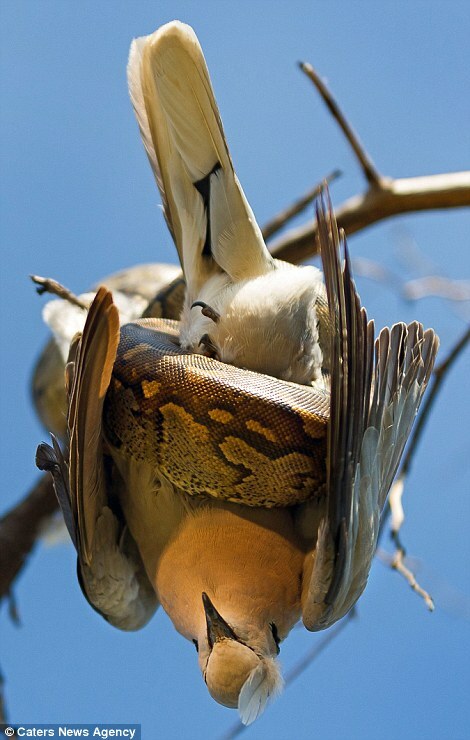 By then, her body was said to have been decomposing with maggots emanating from the corpse. Twins have defied odds of 150,000-1 to both become fathers on the SAME day, in the SAME hospital - and by the SAME midwife. Stunned Jeromme and Jarrell Spence, both 21, have managed to beat the staggering odds to become the proud dads of bouncing baby boys. The twins were initially shocked when told their partners had the same due date of November 26, but neither believed they would both be celebrating on that date. A former racial equality chief who was once invited to Downing Street by Former British Prime minister, Tony Blair has been found guilty of stealing the identity of a severely autistic man 20 years ago. 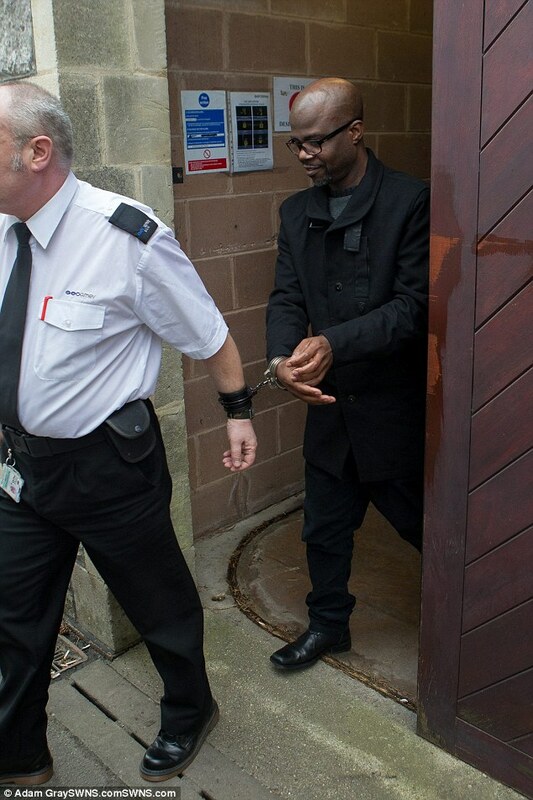 During the deceit David Onamade, 52, was made chief executive of Somerset's Racial Equality Council, meeting MPs, chief constables and even meeting with the then Prime Minister. 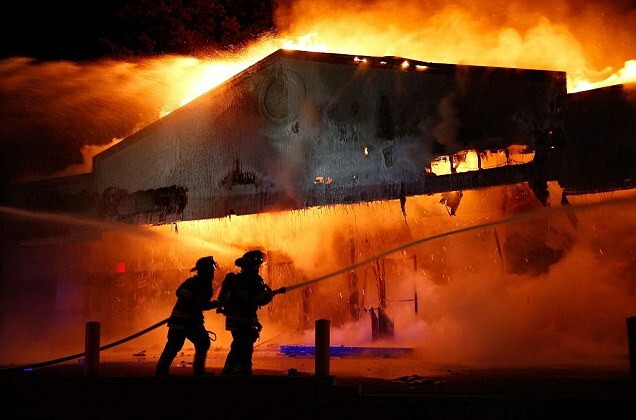 Ferguson, Missouri, descended into lawlessness, chaos and fire (main) overnight as violent looters ran riot after a grand jury decided not to indict police Officer Darren Wilson over the fatal shooting of unarmed Michael Brown. A jury of seven men and five women delivered the verdict that Officer Darren Wilson would not face trial for shooting 18-year-old Michael Brown six times on August 9.